Spring has arrived and summer is right around the corner. It’s that time of year to take your workouts outside and enjoy the nice weather. Break up the monotony by ditching indoor workouts once in while and make a sandbag. With a sandbag, you will have a training tool that can be used for a wide variety of exercises (all for under $30). I can’t think of another training tool that’s more versatile and portable than that! Follow these simple steps and you will be on your way to new and exciting workouts. Anyone can make it! You don’t have to be a personal trainer or a genius to do it. To begin, all you need is an inner tube from a tire (the bigger the tube, the more sand it can hold, therefore the more it can weigh), some duct tape, and some cheap tube sand or playground sand. First, begin by cutting the inner tube to the desired length using scissors (the longer you make it the more sand and heavier it can be). Second, fold up one side of the inner tube and duct tape it shut. Make sure that it’s sealed nice and tight to eliminate any leaking. Third, fill the inner tube with the sand to the desired weight. I recommend weighing it to get an exact weight (Step on your home scale and subtract your own weight). Fourth, repeat step two and duct tape the other end of the inner tube. You’re finished! I recommend making several different sizes so you can progress in weight and use the different sizes for specific exercises. 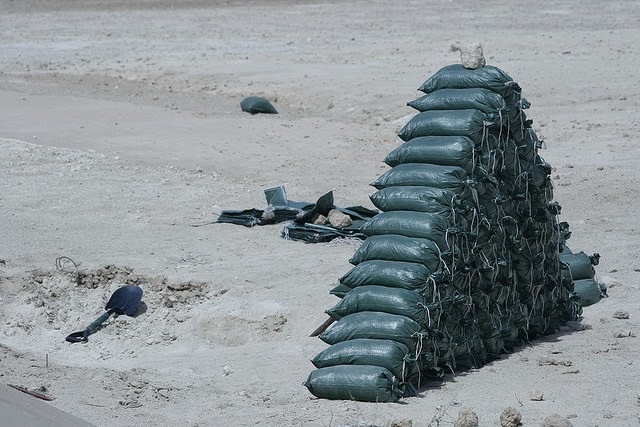 There are going to be some exercises that you will be able to use a heavier sandbag for. This simple, easy to make training tool is cheap and will last. Be creative with your new sandbag exercises. As long as it’s safe, it can most likely be an effective exercise. Check back in, a sample total body workout using the sandbag is coming soon.